While Laurel's life seems neatly on track- a passionate marriage, a treasured daughter, a lovely suburban home- everything she holds dear is threatened the night she is visited by the ghost of her 13-year-old neighbor Molly. The ghost leads Laurel to the real Molly, floating lifelessly in the Hawthorne's backyard pool. Molly's death is an unseemly mystery that no one in her whitewashed neighborhood is up to solving. Laurel enlists Thalia's help, even though she knows it comes with a high price tag. Together, they set out on a life-altering journey that triggers startling revelations about their family's haunted past, the true state of Laurel's marriage, and the girl who stopped swimming. 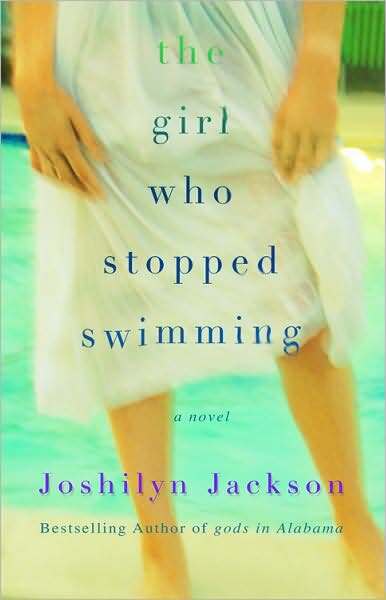 The Girl Who Stopped Swimming is Joshilyn Jackson's third novel. For some reason, after her first two novels, which I enjoyed immensely, and as a loyal reader of her blog, Faster than Kudzu, I never read TGWSS. Shame on me. I do believe it may very well be may favorite of her four novels to date. It also feels very different from her other three novels. The ghost of a drowned girl, Molly, awakens Laurel right at the beginning of the story, and leads Laurel to the dead body, floating in the pool. This starts the action, both physically and psychologically. And there are secrets - some old, some new, some are calling out, some hiding, but all of them want to be revealed. As the layers of the story are peeled back, hidden truths are revealed. Joshilyn Jackson herself said that, "At its heart, this is a book about poverty." Poverty both materially and emotionally. It's also about repression and denial. She does an excellent job handling the complexities of families and marriage. Although the mystery of the drowned girl is solved, The Girl Who Stopped Swimming is not just a mystery novel. It is a family drama, including sisters clashing, family discord, and marriage questions, that also has several mysteries that need to be solved and secrets that need to be revealed. Jackson is a fine, accomplished wordsmith and creates totally believable, complex characters. Using the Watership Downs character Cowslip as a verb, cowslipping, was brilliant. Her descriptions are always memorable. But most of all, she knows how to tell a story and make us care about what happens to her characters. Until he drowned girl came to Laurel's bedroom, ghosts had never walked in Victorianna. The houses were only twenty years old, with no accumulated history to put creaks in the hardwood floors or rattle at the pipes. opening. "But her house did not feel normal. It was silent and too large around her, as if it had been hollowed out. The wrongness in her yard had it's nose pressed against her glass doors, and she felt something small and feral scrabbling in her belly. Every time she thought she'd lose herself in her work, the something would run one spiky tooth along her stomach lining. It was too quiet, as if Daddy had herded everyone together and they had crept out of the house and driven away, leaving Laurel alone with her ghosts. pg. 86"